Home Logo link to homepage. UMass scientists investigate what causes the insidious disease and how to prevent it. Breast cancer begins with one lethal rogue cell. Cancerous cells in the breast then grow out of control in a mind-boggling process that researchers worldwide have yet to fully understand, despite years of study and billions of dollars in funding. At the University of Massachusetts Amherst, researchers in many areas, backed by government organizations and private foundations, are attacking breast cancer on multiple fronts. They are investigating environmental toxins and breast milk, leading large epidemiological studies, creating new treatments, identifying individuals likely to get breast cancer, and advocating for changes in chemical testing and regulation. UMass Amherst scientists work in the forefront of research into breast cancer prevention and causes. This investigative focus is not the norm; most breast cancer funding supports research into early detection and treatment rather than prevention and causes. Three years ago, however, the National Cancer Institute (NCI), the largest funder of cancer research in the U.S., made prevention research a higher priority. Now, 5 percent of the NCI’s budget is allocated to grants for breast cancer prevention. UMass Amherst received $3.5 million as one of six institutions to receive funding from a breast cancer research program cofunded by the NCI and the National Institute of Environmental Health Sciences. Profiled here are five UMass Amherst researchers who are targeting breast cancer. Their work is vitally important to women, as 12 percent are predicted to be diagnosed with breast cancer in their lifetimes. This research gives hope to the 268,670 women and men who are expected to learn they have breast cancer this year and it will help lower the 41,400 annual breast cancer deaths. D. Joseph Jerry with an embroidered molecular structure of estrogen, a gift from a graduate student. The work of UMass cancer researchers is furthered by a remarkable resource that provides opportunities to study and experiment with live cells, the Rays of Hope Breast Research Patient Registry. More than 1,000 women with and without breast cancer have joined the registry, housed at the nonprofit Pioneer Valley Life Science Institute (PVLSI), in Springfield, Massachusetts. Here, patients’ cells are kept alive in liquid nitrogen tanks, placed in petri dishes stored in an incubator maintained at body temperature, replicated, and used in real-life experiments. The patient registry is rich in information: besides the cells, it includes breast tissue samples, health and demographic information, and permission to contact patients in the future. Jerry, who is science director of the PVLSI and also a professor of veterinary and animal sciences at UMass, says he is fortunate to be part of the larger collaboration between clinicians, scientists, and patients. The PVLSI, established in 2002, is a nonprofit partnership between UMass Amherst and Baystate Medical Center, the largest hospital in western Massachusetts. In 2011, the Rays of Hope Center for Breast Cancer Research was founded to support advocacy for research in western Massachusetts and develop the Breast Research Patient Registry. The live cells in the registry demonstrate cellular activities that can reveal sensitivities to environmental chemicals in a subset of women. They also may reveal opportunities for clinical therapies, explains Jerry. “We’re hoping to use these cells to then more capably say, yes, this is the group of people who are most likely to respond to a particular therapy,” he says. Jerry has been investigating why cells mutate and become cancerous in some people as well as why mutations occur but produce no tumors in other individuals. His work builds on research on the TP53 tumor suppressor gene, a gene that is commonly mutated in breast cancers. In mouse models, he found that the gene is not uniform in its behavior, causing some strains of mice to develop breast cancer while others escape the disease. This reveals that cancer is more than a single mutation; understanding the context of mutation will bring more insight into the causes of breast cancer. “We have not reached that goal of the cure we have been dreaming about, but we have made real steps toward it and we keep hoping that tomorrow will bring the fundamental change,” says Jerry. Women from all over the country send Kathleen Arcaro breast milk samples for research purposes. 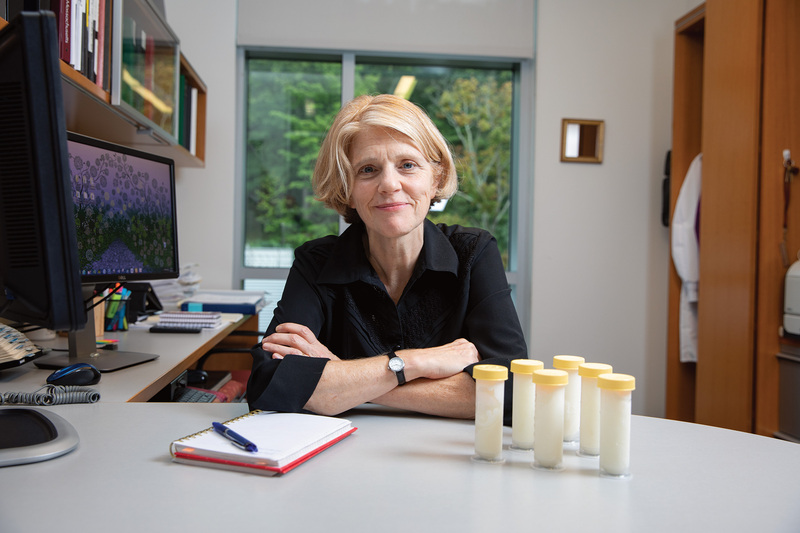 When Kathleen F. Arcaro, professor of veterinary and animal science, decided to study breast milk to see if she could learn about the origins of breast cancer and how to more accurately predict who will get the disease, she found little enthusiasm for the new approach. “Nobody thought it was a good idea, especially the funding agencies,” says Arcaro. 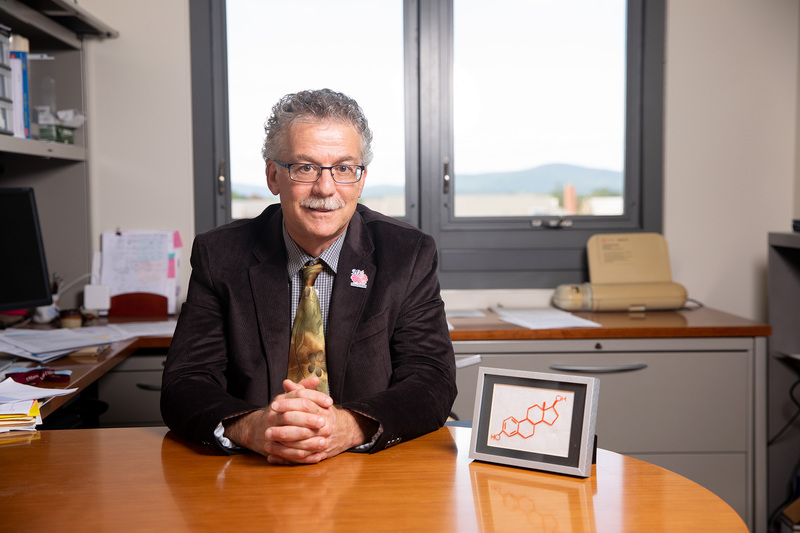 Undaunted, Arcaro initiated research in 2004 by collecting breast milk from lactating women in the UMass Amherst community and studying cells in the milk. She soon discovered that these cells could reveal breast cancer risk. Since she launched her quest to study breast milk, Arcaro, a faculty member since 2001 with a lab in the Life Science Laboratories building, has won millions of dollars in grants and expanded the collection of breast milk from Amherst area women to include women with more geographic and racial diversity. Women from all across the country have donated breast milk samples. Focusing on DNA and genes that can trigger the growth of cancer cells, Arcaro showed that lactating breasts hold valuable information about risk and the beginning of breast cancer. She has examined which genes may trigger cancer. “I wouldn’t say at this point that I have shown that I can detect breast cancer, but I am getting closer,” says Arcaro. It is an important finding, since the majority of women diagnosed with breast cancer are past child-bearing age. If women at risk can be identified very early, lives will be saved. At the heart of Arcaro’s research is DNA methylation, a mechanism that can modify the turning on and off of genes. Arcaro is investigating the extent to which the pattern of DNA methylation that relates to inflammation and cancer can be changed with a diet of fruits and vegetables. Women in the study who were given fresh produce to add to their diet showed an increase of a hormone associated with low risk for breast cancer. She envisions a future where breast milk will be tested for cancer risk as simply and routinely as newborns are screened for metabolic diseases through a heel-prick blood test. Laura Vandenberg with mouse mammary glands she studies for insight into the impact of environmental chemicals. Laura Vandenberg, associate professor in the School of Public Health and Health Sciences, has two jobs: she works as a scientist who documents dangers to human health from chemicals, and she researches public policy changes that are needed based on her findings. 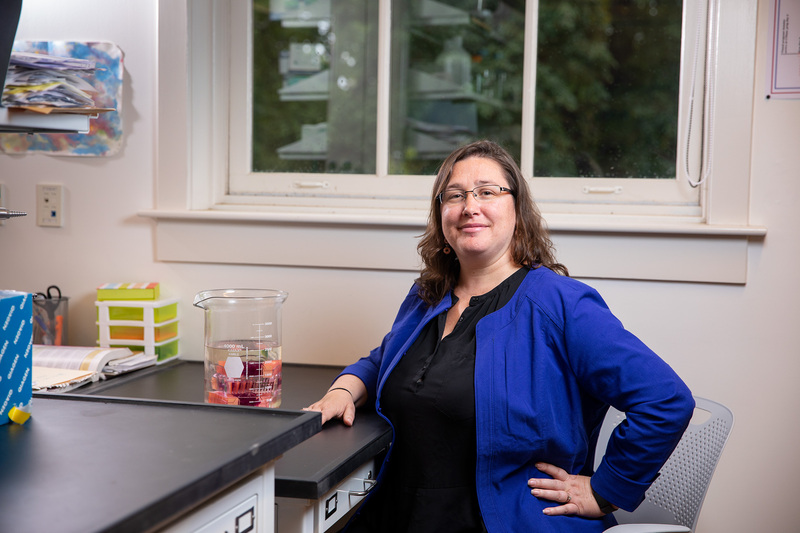 Her laboratory work in the Goessman building has centered on the impact of endocrine disruptors—chemicals that mimic or block hormone action—on breast function and disease. Policy work pits Vandenberg against powerful forces as she promotes tighter chemical regulations and rigorous safety testing. Unlike most researchers, who have focused on the impact of chemicals during fetal development, Vandenberg also studies their effects on mothers. “We have known for a long time that the fetus is sensitive to estrogenic chemicals, but we had assumed that the mom will be fine. How silly was that?” asks Vandenberg. She discovered that mice are sensitive to environmental chemicals, especially during pregnancy, and impacts are felt on their mammary glands, reproductive tracts, maternal behaviors, and brains. Most of her work has been funded with multimillion dollar grants from the National Institutes of Health. Her work builds on research into the use of DES, a synthetic estrogen that caused cancer in daughters born to women who used the drug during pregnancy and increased the risk of breast cancer in mothers long after they stopped taking it. For Vandenberg, the call for better safety testing of chemicals was a natural outgrowth of her research into the causes of breast cancer. She sought an answer to the question many would ask: “How on earth did we allow estrogenic chemicals to be used in so many consumer products?” She was one of 12 experts who coauthored a highly cited paper on endocrine disruptors that sparked meetings of scientific and regulatory organizations, including the Environmental Protection Agency and the National Academy of Sciences. Vandenberg has been lauded for her willingness to be a public critic of agencies that regulate chemicals in consumer goods. “Advocating for public health is the most important thing I can do in my career,” she says. Susan Hankinson uses detailed biologic and survey data to refine risk-prediction models. If you want to know your risk for breast cancer, ask Susan Hankinson, professor of epidemiology and an internationally renowned breast cancer scholar. “We found that by querying a range of known breast cancer risk factors, as well as taking a single blood sample, we can get an idea of a woman’s risk of breast cancer over the next 10 to 20 years,” she reports. In her office in Arnold House, Hankinson is refining risk prediction models and ways to better identify whether at-risk women have a low or high chance of developing breast cancer. With the benefit of more precise risk-factor calculation, low-risk women will not take unnecessary medicines or undergo needless frequent breast screening, and high-risk women can make more informed decisions to lower their risk. “We want to do a much better job at telling women what their risk is,” explains Hankinson. 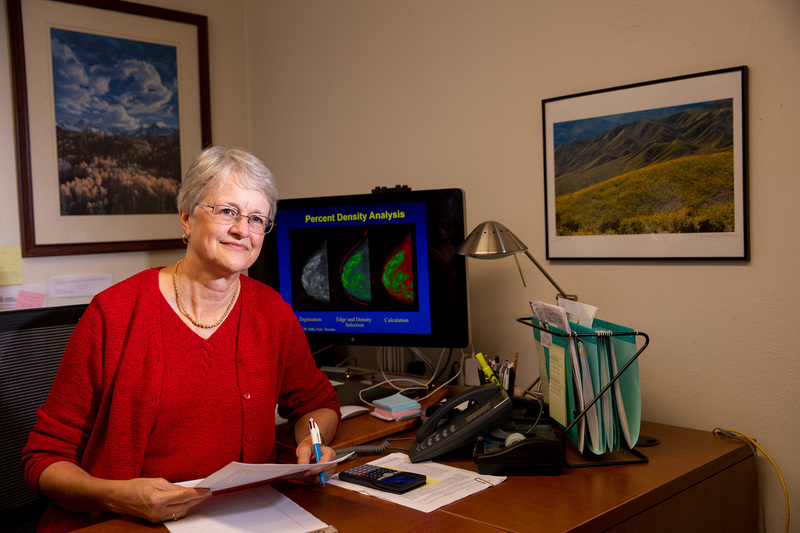 Hankinson’s earlier work advanced the understanding of the role hormones play in breast cancer. As a senior investigator on the Nurses’ Health Study, a long-running study of more than 200,000 women in several cohorts, Hankinson oversaw the collection of blood samples from nearly 60,000 study participants. Research emanating from this sample archive has provided—and will continue to provide—tremendous insight into the role hormones play in risk of breast and other cancers in women. Further, she has worked to establish a national standardization program for measuring hormones in women, leading to more accurate results. Hankinson has received many multi-million dollar grants over her career. Her latest is a $4.2 million grant from the National Cancer Institute to further study whether hormones increase risk of breast cancer. “I think finding a cure for breast cancer is critical, but preventing the disease entirely would be even better,” says Hankinson. Shelly Peyton with a microscope that allows researchers to watch breast cancer cells invade, grow, and respond to different drugs. Most women don’t die from the primary breast cancer tumor. It is the metastasis—insidious spreading of the cancer to bones, lungs, liver, and the brain—that is deadly. https://che.umass.edu/faculty/shelly-peyton Shelly Peyton, a UMass Amherst chemical engineer, wants to know why breast cancer survives far away from its original site. Her ultimate goal is to bioengineer a new treatment for breast cancer. In her lab in the Life Science building, she and a team of 20 researchers, including a post-doctoral researcher, graduate students, and undergraduates, have been making significant headway with an uncommon approach to breast cancer research. Peyton is creating artificial tissue that is then injected with different breast cancer cells. She has produced artificial bone, lungs, and brain tissue. The experiments have uncovered a treatment that reduced tumor size. 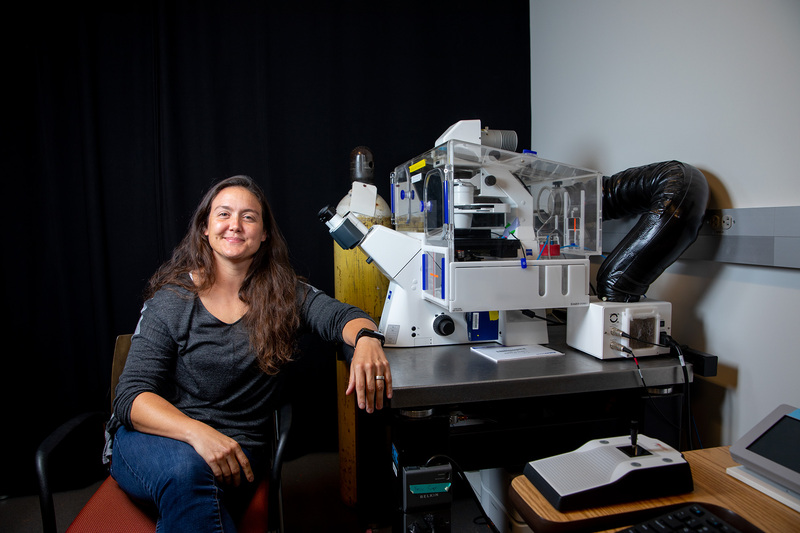 “We really needed these complicated artificial tissue environments to predict how a treatment will work,” explains Peyton, who began teaching at UMass Amherst in 2011 and has generated $10 million in grant funds to support her research. The National Science Foundation and the National Institutes of Health sponsor Peyton’s research. Peyton was a Barry and Afsaneh Siadat Career Development Fellow from 2012 to 2017. Barry Siadat ’77G, ’79PhD created the program in 2012 and funds it with $150,000 annually. Peyton used Siadat and grant funds to purchase sophisticated equipment such as a machine that uses lasers to capture deep images of bone marrow. “Some of the equipment we have here is unmatched at any other place that I have been,” Peyton says. With the equipment, Peyton watches live cells move through the artificial tissue to learn methods to stop cancer cell migration. “It is this idea of cell movement and invading different tissue sites that got me interested in breast cancer research,” says Peyton. Using artificial tissue has other benefits, she adds. The need for animal testing is reduced and results come quicker. The UMass Amherst breast cancer research featured in this story received private support from Pew Charitable Trusts, Breast Cancer Research Foundation, Jayne Koskinas Ted Giovanis Foundation for Health and Policy (JKTG Foundation), Cornell Douglas Foundation, Great Neck Breast Cancer Coalition, Avon Foundation for Women, and Keep A Breast Foundation. Doing something the world should know about? Let us know and you may be featured in the magazine.